This mug is the perfect gift for any dog owner that is proud of their furry best friend! 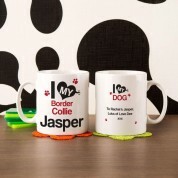 With a bold red and black design, the mug features an "I Love My Dog" graphic - complete with a wagging tail heart! 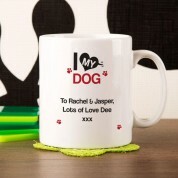 It's fully personalised in house with the precious pooch's breed, name, and a personal message on the back. It's an ideal gift for all dog owners - from new puppies to old faithful friends. 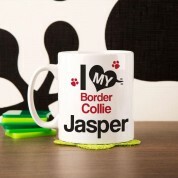 Great for showing off your dog at home or in the office.